Evaluator/s: Tobias, J., Crosby, M., Peet, N., Collar, N. & Benstead, P.
to be threatened by exploitation of scrub-forest, livestock grazing, disturbance and quarrying. IUCN 2007. 2007 IUCN Red List of Threatened Species. <www.iucnredlist.org>. Downloaded on 10 April 2008. Glareolidae. The bird was named after the zoologist Thomas C. Jerdon who discovered it in 1848. Society after being thought to be extinct. inhabiting a sparse scrub forest interspersed with patches of bare ground. 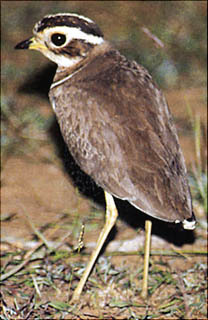 It is an unmistakable compact courser, with two brown breast-bands. It has a yellow bill with a black tip, a blackish crown, broad buff supercilium, and orange-chestnut throat patch. In flight it shows a mostly black tail and a prominent white wingbar. It is a crepuscular bird and is known to be vocal at dawn and dusk with in a series of staccato Twick-too...Twick-too... Twick-too calls. rediscovery in 1986. It remains critically endangered due to loss of habitat. It is nocturnal in habit and presumed to be insectivorous. Being a rare bird, nothing is known yet about its behaviour and nesting habits. 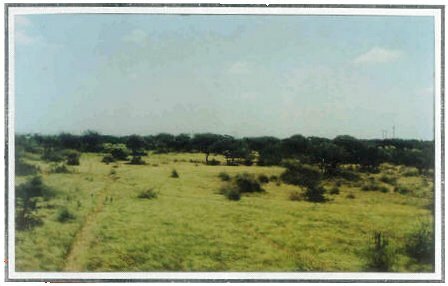 techniques such as tracking strips where the footprints may be recorded. into the region where the Courser was rediscovered. These areas of Lankamalai, Palgonda and Seshachalam were previously not well populated. With the rising population here, there is also livestock pressure and firewood extraction. In addition extensive quarrying threatens the habitat. project which threatened to destroy and alter the habitat of the species. The area has also been threatened by illegal construction work and activities related to a project proposed to link the rivers of India. by the recent canal construction.